Special Antique Cameo Brooch [SH8274] - £650.00 : loveVintageDiamonds.com, Your Vintage Diamond Dreams Come True! 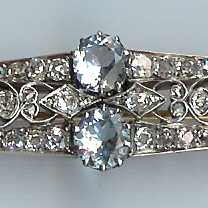 Leave harsh reality behind and enter the luxurious world of a bygone age with our extensive collection of highly desirable Vintage and Antique Jewellery. We value you custom very highly and will take care of your order as if it were our own. Your order will be well packaged and will include a presentation box. We will also gift wrap on request. We hope we have made the process of buying online as simple and as safe as can be. Both parties should have mutual security in the transaction therefore we have pared down the options. You can either pay direct to our bank or use Paypal (which you can do with a credit card and without the need for a Paypal account). When payment is verified we will dispatch your order to your registered address. 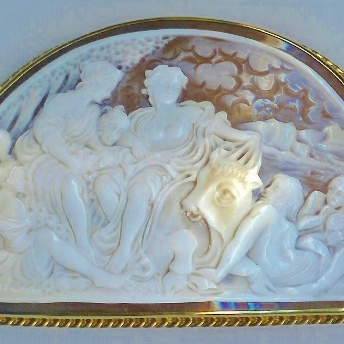 This antique cameo brooch is a rare Victorian piece. 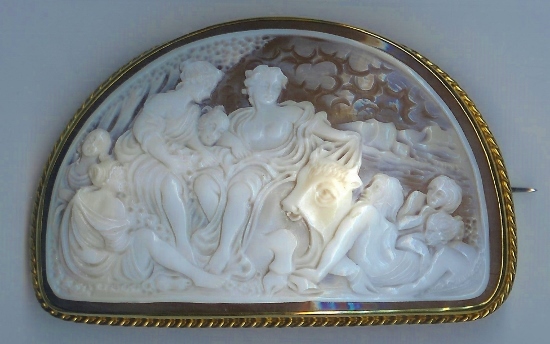 The engraved shell depicts a shore-side scene of seven maidens and one male admiring a bull. It is impossible to do justice to the fine detail in this piece by mere description; it really does warrant close inspection. 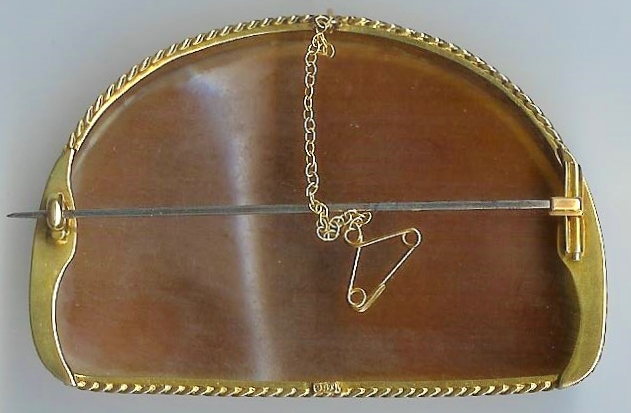 It is a half-moon shape and set in a substantial 9ct yellow gold mount with rope effect edging. The pin, as would be expected, is not gold and is rather a base metal. 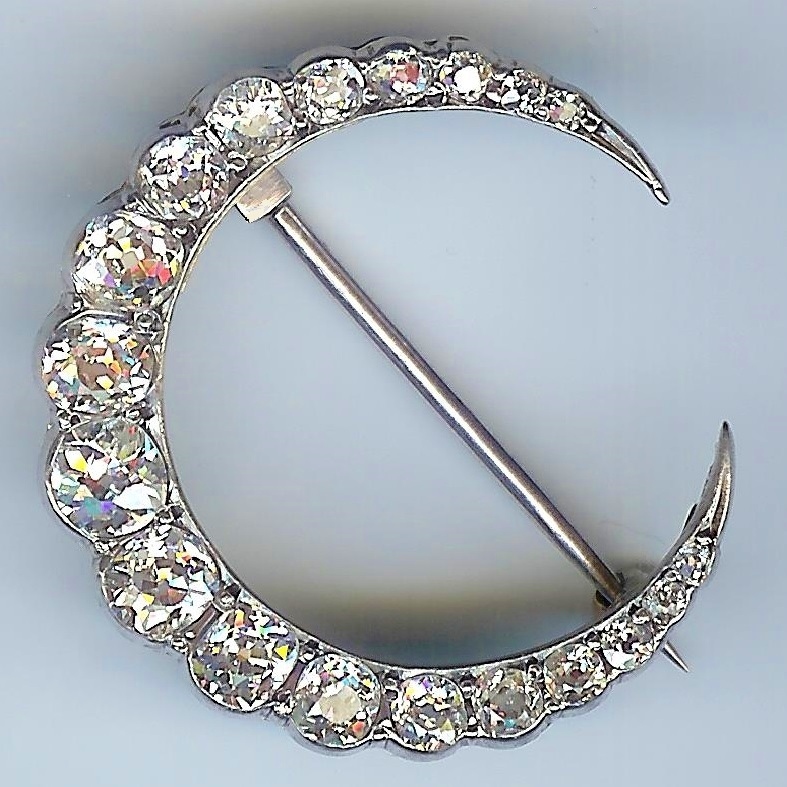 The brooch also has a 9ct yellow gold safety chain and pin. It measures approximately 48 x 70mms and weighs approximately 33.6gms.